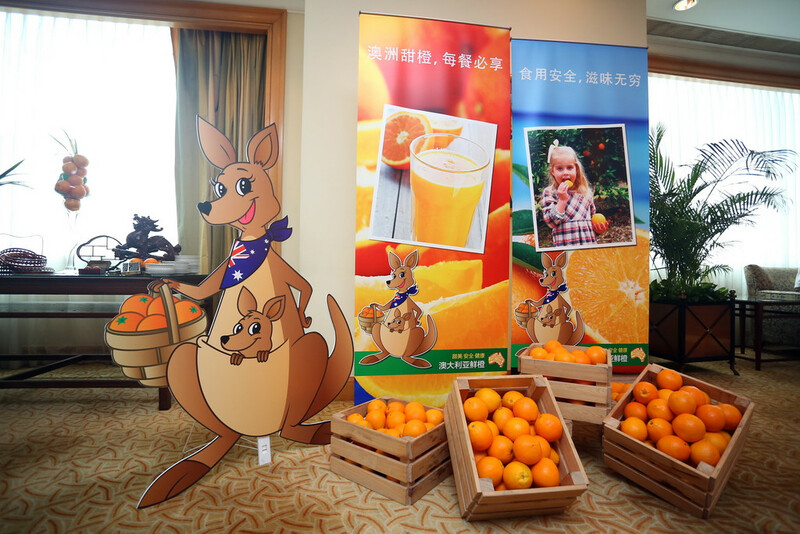 On 17 July 2014, more than 80 members of the Chinese and Australian governments, media, and fresh fruit industry gathered at the Four Seasons Hotel in Shanghai to celebrate the beginning of the Australian orange season. 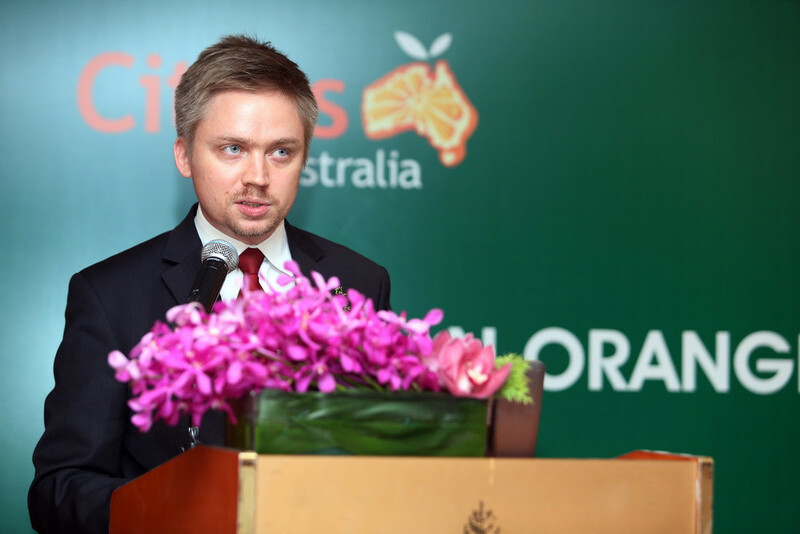 Jointly organized by the Australian Trade Commission in Shanghai and Citrus Australia, the event kicked off with a welcome speech by Brent Moore, Trade Commissioner of the Australian Consulate-General Commercial Section. Mr. Moore described the evolution of Australia’s agricultural trade with China over the past 40-plus years, and explained that in recent years the China market has become increasingly important to Australia’s 1,800 citrus farms. Mr. Moore’s remarks were followed by an introduction to Shanghai CIQ’s role in the Australian citrus trade by Bai Zhang Hong, Director of Animal and Plant Quarentine, Shanghai CIQ. Mr. Bai told the audience that Australia’s fruit shipments to China have increased by 57 times over the past four years, largely because of the increasing volume of Australian citrus. He noted that this increase was at least partially driven by consumer demand for the superior flavor and color for which Australian citrus is recognized around the world. Mr. Bai also described his recent trip to Australia during which he stayed for nearly one month in Madura, one of the largest citrus producing regions, and was highly impressed by the level of care that is given to ensuring the quality, safety, and traceability of Australian fruits exported to China. Mr. Bai’s remarks were followed by a speech from Sophia Xue, Deputy Director of the China Agricultural Wholesale Markets Association (CAWA). Ms. Xue described a recent delegation of CAWA members to Australia to visit orange production operations that she felt played an important role in strengthening the citrus trade between Australia and China. Ms. Xue also mentioned that among her 4,400 wholesale market members, 1,200 were specialized in fresh fruits and vegetables, and that these markets still serve as the primary distribution channel for imported Australian citrus in China. CAWA will be holding two events this November in Shandong province and Beijing at which Citrus Australia will also take part. Following Ms. Xue’s speech were presentations from two key figures from Citrus Australia that had traveled all the way to China to attend the event and promote their country’s oranges. Andrew Harty, General Manager of Market Development, presented an introduction to the Australian citrus sector, and the Sweet, Safe & Healthy message. Mr. Harty noted that the CAWA delegation was a great success and one of the most important visits from China that the orange industry has received. He strongly emphasized that the success of Australian citrus in China was not only due to the fruit quality, but also represented the result of years of hard work by the industry to upgrade their orchards, processing, and packing facilities to meet the strict requirements of Chinese inspection authorities. These efforts reflected the devotion of Citrus Australia to pursuing long-term relationships with Chinese partners, and ensuring the future success of the Australian citrus sector and enjoyment of Australian citrus by Chinese consumers. Nevertheless, Mr. Harty explained it is ultimately the unique climatic and geographic circumstances of Australia that allow for the production of such high quality oranges. Oranges are grown in every state and region in Australia, for which the range of climates from north to south provide a long season, which is counter seasonal to both Chinese and North American orange seasons. In particular, the clean water and constant sunshine throughout the country contribute to the high sugar content of Australian oranges, while the cold nighttime temperatures give the fruit its deep orange color. Most Australian citrus farms are small, family run operations approximately 40-100 hectares in size, although there are also some corporate farms as large as 1,600 hectares. Mr. Harty’s presentation was followed by an introduction to food safety practices in the Australian citrus industry by David Daniels, Market Access Manager of Citrus Australia. Mr. Daniels explained that integrated pest management (IPM) is used on all Australian orange farms, which is much safer than agrichemicals, and that all consignments are traceable from farm to market. He also described a food safety program specifically for citrus that was jointly established by Citrus Australia and the Australian government. In the program’s three year history, over 700 tests have been conducted on Australian citrus, 100 percent of which have achieved compliance with Chinese standards. The speaker portion of the event concluded with a short presentation by Mr. Harty on the health benefits of eating Australian oranges. Mr. Harty expressed regret that Western-style junk foods had spread throughout the world and now serve as competition to healthy fruit and vegetable alternatives such as Australian oranges. Mr. Harty explained several important health aspects of Australian oranges that are particularly desirable to Chinese consumers. These included high vitamin A and C content, as well as flavonoids which provide antitumor and anti-inflammatory effects. Fiber from oranges also encourages a healthy bowel and a healthy heart, while folate from oranges is essential for pregnant women to give birth to healthy babies. Following the presentations, attendees had the chance to taste 9 different dishes that had been prepared by the Four Seasons Hotel executive chef demonstrating the fruit’s diversity in culinary applications. Media and trade attendees excitedly gathered around the masterfully prepared food displays and took photos with the Citrus Australia kangaroo. Citrus Australia is the association representing Australia’s citrus industry. Citrus Australia serves the citrus industry by focusing on public affairs, market access, trade development, production information, industry communication, and biosecurity/plant health.